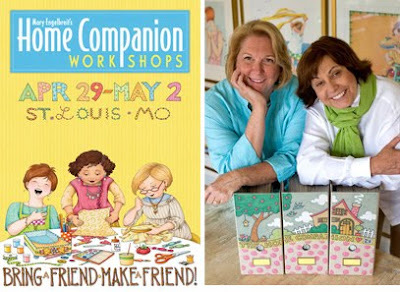 I am so excited, I decided to bite the bullet and sign up on my own for the Mary Engelbreit workshops which will be held next April in St Louis!! I know one of my swap sisters, Peggy, will be there, so I'm sure I'll meet some Bella's that will head down there too before now and then! So looking forward to it!! I will share the classes and instructors with you soon. Let me know if you plan on attending!! Hi Rachel - Yeah! So glad you signed up... I think this is going to be amazing event. Look forward to seeing you in almost 6 weeks in Omaha! Looks like a lot of fun! Can't wait to hear all about it!